Harissa is a paste from North Africa with all the flavors of the Mediterranean; cumin, coriander, caraway, mint and chilies. It is great as a marinade for grilled lamb, beef, chicken or fish. 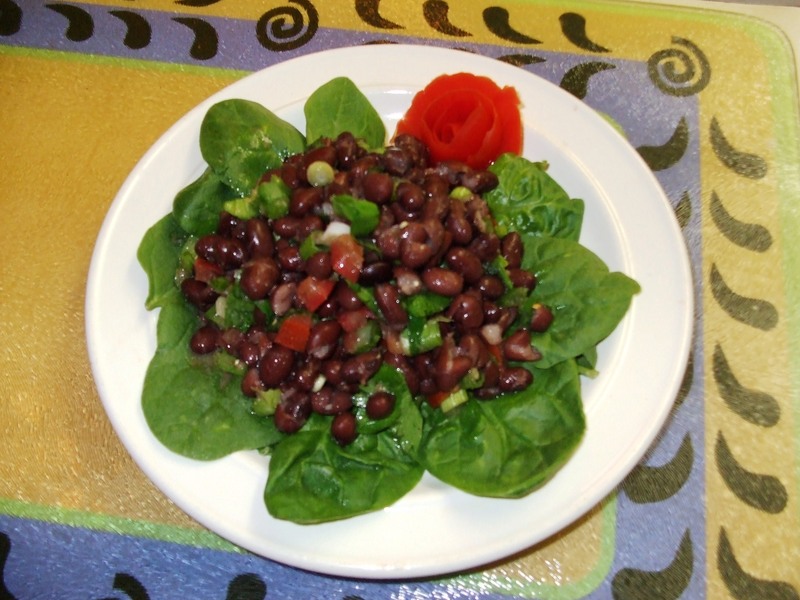 You can make this with fresh serano, cayenne or habanero chilies. 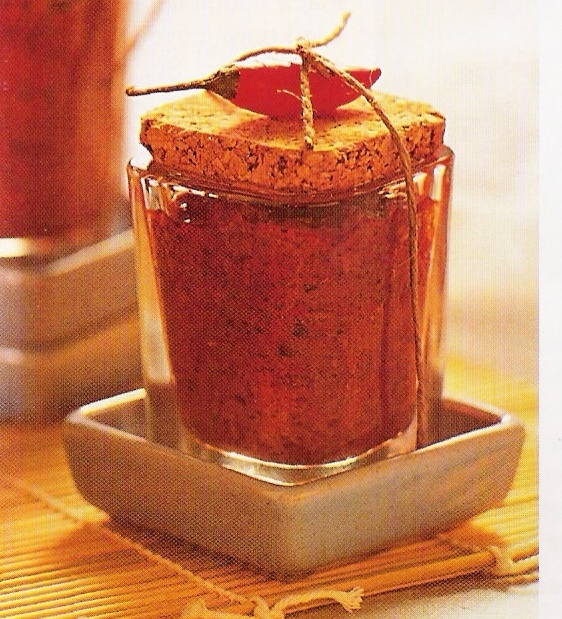 If you’re growing chilies in your garden, put up a batch of harissa while they’re fresh. If you prefer a milder harissa, use red ancho chilies (ripe poblano chilies). There certainly is no reason why you couldn’t make this Morrocan paste with chipotle peppers (smoked red jalapeno peppers) also. The smoky tones would add another flavor dimension. The yogurt in the sauce recipe given below will tame the heat of the chilies and the honey and cinnamon will add a touch of sweetness which will also help caramelize the surface of the salmon when cooking. There’s just enough orange juice to give it a sour note and balance the rest of the flavors. Harissa and yogurt makes a tasty dip for sesame coated lamb meatballs. Check out Cat Cora’s recipe video at McCormick Gourmet. Chicken tenderloins can be marinaded with the harissa and grilled on skewers. Harissa marinaded flank steak grilled with fresh eggplant and bell peppers is especially tasty served with your favorite couscous, Mediterranean black bean salad and fresh figs with yogurt and honey. Harissa paste is super easy to make, there’s no cooking, and is best made a couple days before using. It will keep in the refrigerator up to 6 weeks. This recipe makes about 1-1/2 cups. It may be doubled or tripled and spooned into hot sterilized jars up to 1/2 inch from rims. Cover with 1 Tbsp olive oil before sealing and refrigerate. This makes an unusual hostess gift or gift for your favorite foodie. Process chilies, garlic, salt, seeds and mint leaves in food processor until smooth. Reserve 1 Tbsp olive oil and add remaining oil to chili mixture in a steady stream while processor is running. Spoon harissa into a glass jar and drizzle with reserved oil to cover. Seal and refrigerate. Salt and Pepper salmon fillets. Fold thinnest end of each fillet to the top of the fillet so that each fillet is relatively the same thickness from end to end. Combine remaining ingredients in a small bowl and whisk to incorporate. Remove 4 Tbsp of sauce for marinade. Chill remaining sauce until serving time. Spoon marinade over top and skin side of each salmon fillet. Let sit for 20 minutes. Place fillets, skin side down, on grill 6 inches from heat source and cook for 3-5 minutes on each side, until both sides are golden brown, turning once. Do not over cook. The center of each fillet should be pink to red depending upon your preference. Cooking it well will dry it out. Serve with a dollop of chilled sauce and garnish with chopped mint if desired. You may grill on a flat iron or a non-stick skillet. Drizzle olive oil on hot grill or non-stick skillet. When oil is hot but not smoking place fillets on grill, skin side down. Cook as instructed above. Dried chilies may also be used to make the Harissa paste; just soak dried chilies in hot water to cover. Let stand 20 minutes and drain. Process as directed. My neighbor in St. Thomas, Virgin Islands, served this dish at a small dinner party I attended. The pork chops were moist and tender with a caramelized nutty flavor from the coffee liqueur and just seasoned enough from the soy sauce. I’ve added a few more ingredients to give this marinade an Asian tweak. This also works well with chicken. You can grill or bake instead of broiling, or use the marinade to baste a roasted chicken, baked ham, or grilled kebabs. For an island style meal, serve with boiled green plantains in coconut milk, fresh mango salad with onion, cashews and bib lettuce dressed with a mandarin orange vinaigrette. Recipe is for 4 servings of pork chops 3/4 inch thick. Place onion, garlic, ginger root, lemon grass and chili in a food processor and pulse until finely chopped. Add Kahlua and soysauce and whirl for 2 seconds to combine. Pour marinade into a glass pan large enough to hold pork chops in one layer. 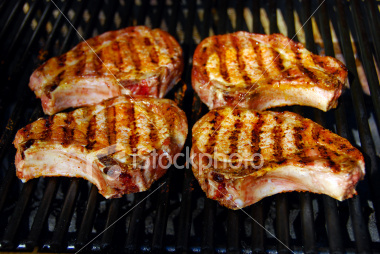 Marinate pork chops for 20 minutes on each side. Broil chops 6 inches from flame for 5 minutes, turn, baste, and broil for additional 5 minutes. 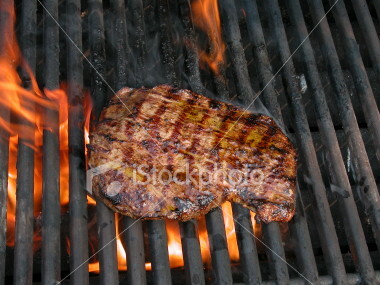 Grilling time is here so dust off the BBQ, stock up with propane or briquettes and get to grilling. My friends in Gig Harbor, Jodi and Michaela, are probably the only two people I know who can actually bake a cake in their gas grill. While their kitchen was in the throws of a remodel, the oven was dismantled and the grill got a whole lot more use. Their chocolate brownies were excellent. Necessity is the mother of invention, so they say. This marinade with pineapple also tenderizes the meat and gives flank steak an Asian tweak. Remember flank steak will be tough if over cooked so be vigilant. Grill up some peppers and onions, a couple big portabella mushrooms, bake some potatoes and corn on the coals and you’ll have a meal fit for royalty. Combine all ingredients, except steak, in a gallon sized zip-lock bag, massaging to mix. Place steak in the bag in one layer making sure marinade is evenly distributed. Refrigerate at least 3 hours. Grill 6 inches from coals for 5-7 minutes on each side, turning once. Slice steak pieces into strips to serve. This recipe is my version of a marinade from Luna Rossa, an Italian Restaurant in Tonga, owned by my good friend and great chef, Marco Veranesi. Marco made a batch of this everyday to sauté mussels, marinate steaks, toast bread for bruschettas and a host of other chores. I love this on octopus with capers, lemon, and celery for a first course. Its also fabulous for sauteing chicken in white wine (Poullet au Vin Blanc), steamers Portugese style, and a host of other dishes. It will keep in the refrigerator for at least a week. Place garlic, salt and parsley in a food processor, whirl until pureed. Slowly add olive oil until all is emulsified. Massage to coat all pieces and let marinate at room temperature for 30 minutes. Refrigerate if longer time is needed but bring to room temperature before grilling. Pat dry with paper towel to remove excess marinade before placing over coals. May also pan fry in a skillet without removing excess marinade. Add 1 Tbsp of butter to assist browning.